In 2017, the Swiss Confederation introduced a new management model (known as NMG) to better manage the federal administration and facilitate steering at all levels. It is worth understanding this model better, how it is applied in practice, and to consider whether it can inspire new ways of managing the public sector. 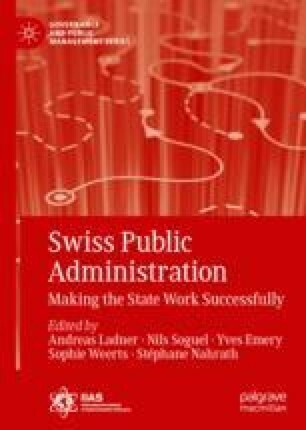 Will the NMG become the “Swiss way of management” in the public sector? To answer this question, we first look at the GMEB model, a precursor to the NMG. We then describe the peculiarities of the NMG, and in what manner it is “new” compared with other Swiss and foreign approaches; here we introduce the “public performance diamond”. Finally, we examine the case of Swiss Federal Office of Topography (swisstopo), an office which was both a pioneer in adopting the GMEB model and one of the first to use the new NMG mode. Federal Council. (2013a). Federal council press release of 20 November 2013, Retrieved from www.efd.admin.ch/efd/en/home/dokumentation/nsb-news_list.msg-id-51039.html. Accessed 22 Nov 2017. FFA. (2017). Nouveau modèle de gestion NGM. www.efd.admin.ch/efd/fr/home/themen/finanzpolitik/nouveau-modele-de-gestion-de-ladministration-federale--nmg-/fb-neues_fuehrungsmodell_bv.html. Accessed 30 Sept 2017.